temporarily added to, invoked, then removed again. The first argument is bound to this for the current scope (within the current function body). Be wary of what this is bound to. I talk a little more about this below. If you have no arguments to pass to the applied method, call or apply will achieve the same result. Method on the left is applied to the object on the right. On line 05 we declare the extensions object and augment it to our single BINARYMIST object. 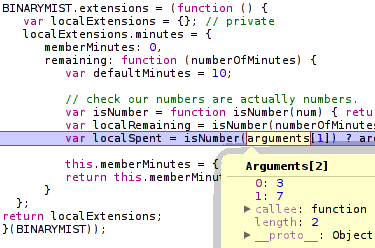 If we replaced the apply method from line 34 with call, the outcome would be exactly the same. You’ll also notice on line 34 and 35, that the remaining method of BINARYMIST.extensions.minutes returns a minutes property. 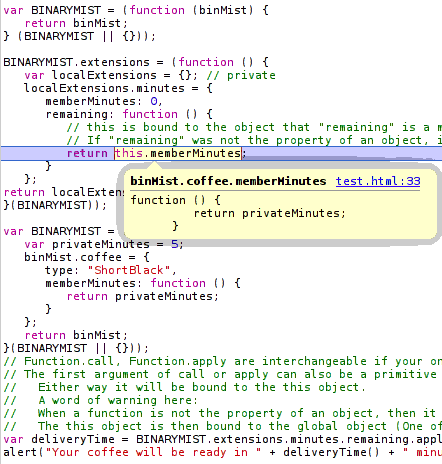 Once BINARYMIST.extensions.minutes.remaining is applied to BINARYMIST.coffee, return this.minutes now returns a function that returns privateMinutes. // this is bound to the object that "remaining" is a member of at runtime, because "remaining" is a property of the object "localExtensions.minutes". // If "remaining" was not the property of an object, it would be invoked as a function rather than a method. "this" would be bound to the global object. // Function.call, Function.apply are interchangeable if your only using a single parameter. // The first argument of call or apply can also be a primitive value, null or undefined. // Either way it will be bound to the this object. // When a function is not the property of an object, then it is invoked as a function. If the first parameter to apply or call is null, then the this is bound to the global object upon invocation. When you invoke a function that is not a method, this is exactly what happens. You may have noticed, I’m using the module pattern in the above example. This pattern is effective for getting our objects nicely nested into a single namespace (or more correctly an object ) that sits in the global object. This stops us from littering the global space with every object we create. You can also see from the following image, what’s private and what’s public. So we can easily define accessibility. What are the differences between apply and call then? You can think of Function.prototype.call as being syntax sugar on top of Function.prototype.apply. If you only have a single parameter after the first, your better off to use Function.prototype.call as it’s more efficient than creating an array for a single value. The difference is in the parameters after the first invocation context argument. With call, an arbitrary number of arguments can be passed. Following the first argument, each argument will be passed to the extension method. In our case remaining (line 09 above). So we could make the following changes to the above code. You’ll notice on line 8 below once applied to BINARYMIST.coffee, no longer returns a function, because we explicitly set this.minutes to a number… 3. Now in the below example on line 16, if we fail to pass an argument to BINARYMIST.extensions.minutes.remaining, by default our coffee will be ready in 10 minutes. Better still, lets pass a couple of arguments.. While we’re at it, lets tidy things up a bit. also known as an anonymous closure. You can see this on line 36.
else we assign the undefined value. // check our numbers are actually numbers. On line 39 we pass in a couple of arguments. because I hate to miss a good opportunity. All functions come with an arguments array. This parameter is populated with all the arguments that were supplied to the function on invocation. This includes any arguments that were not assigned to parameters. As you can see below, arguments holds both values we passed in. The difference with Function.apply is that it only takes 2 arguments. The second being an array of arbitrary length. Function.apply works with array-like objects as well as true arrays. I’ve added some info on Function.prototype.bind introduced in Ecma 262 (I think). This function is very similar to Function.prototype.call. In fact the only difference I can see is that bind essentially returns a reference to the function that applies the function we want to apply to a target function. Essentially this allows us to re-use an applied function, rather than create one each time we want to execute. 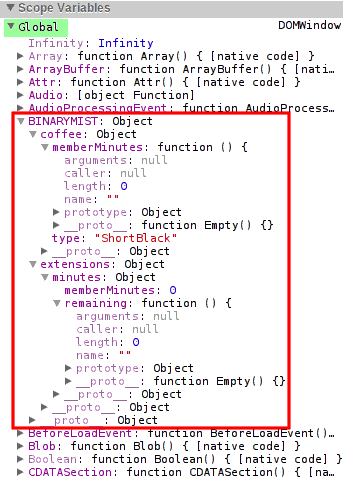 bind has the same function signature (has the same parameters) as Function.prototype.call. This following example was taken from Mike West’s post here with some small changes and comments added. This is tested and works as you would expect. // and multiply inherits the bind property (which is a function of course) because multiply's prototype is Function's prototype. // this is bound to the bind properties object... which in this case is multiply.